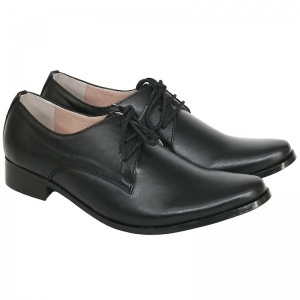 Boys black matt derby style pointed shoes named 'George', suitable for toddler through to junior, perfect to compliment a special occasion suit for a christening, wedding or formal event. We would strongly recommend you check and compare the measurements prior to purchase to ensure you select the right size. These pointed shoes (compared to our standard shoes) are generous in length so we do not advise you purchase based purely on their current size.